Any experienced open water swimmer will be, or at least should be familiar with evaluating personal risk on an ongoing basis. (I have written many posts about the Do’s and Don’t’s of open water). One thing we don’t talk about is drowning, because we put ourselves in the category of people unlikely to join the statistics, just because we are strong, confident and experienced open water swimmers. In some cases below I can’t separate open water drowning from overall drownings. The IWS report is particularly useful for so doing however. The Irish Water Safety Association (which promotes open water safety and collates Irish drowning figures and for decades has taught people to swim in open water locations) released a report about drowning rates in open water locations, based on 25 years of data collection up to 2012 (not including 2013 which had higher rates due to an unusually good summer). The headline figures are startling. An average of 140 people drown every year in Ireland. America’s CDC releases the US figures, and for 2005 to 2009, the annual average is 3,533 (non-boating related). That’s almost 10 per day in the US, of whom two are under 14. The World Health Organisation places drowning as the third leading cause of unintentional death worldwide, accounting for 7% of all injury related deaths. In 2011, 359,000 people worldwide drowned, 95% of them in poorer countries. As the CDC notes, for every child that drowns, another five receive emergency department treatment, and some will suffer long-term disabilities up to permanent vegetative state. If you work out per capita rates, you find Ireland is 0.000035% while the US is 0.000013%, almost one-third of Ireland. However the Irish figures do include boating, suicide and fishing industry accidents. The IWS say that the suicide rate figure accounts for one-third to half of the Irish total, so once that’s accounted for the Irish and US accidental drowning figures aren’t that different. 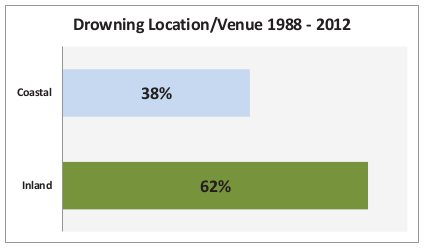 79% of Irish drowning victims are from the local area. 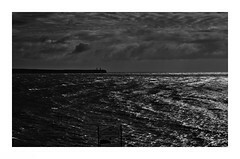 One is never more than 100 miles from the sea in Ireland whereas the maximum distance from any sea in the USA is over 1000 miles. In Ireland 79% of drowning are male, the same as the US. One of the more surprising statistics from Ireland is where the drownings occur and the figure that prompted me to write this article. Ireland’s relationship with the ship has long been difficult. It is only very recently that we’ve started to embrace our coastal heritage, as traditionally the Irish were extremely wary of the Atlantic, understandable when we take the brunt of the wild Atlantic. We swimmers also know that people here assume the sea is more dangerous. The locations listed are varied: Lakes, rivers, canals, ponds, quarries, but also bog holes, drains, slurry tanks and reservoirs. We have a weird sport here called Bog Snorkling (yes, it’s worth clicking on that link and yes, I’ve considered it but I hate kick drills) but I’ve not heard of any drowning during this sport. Such drownings are more likely to occur with bog walkers or people footing (cutting & stacking) turf. Slurry tank deaths are a tragic annual incidence that result when farmers or agricultural workers are overcome by hydrogen sulfide and drown as a consequence). 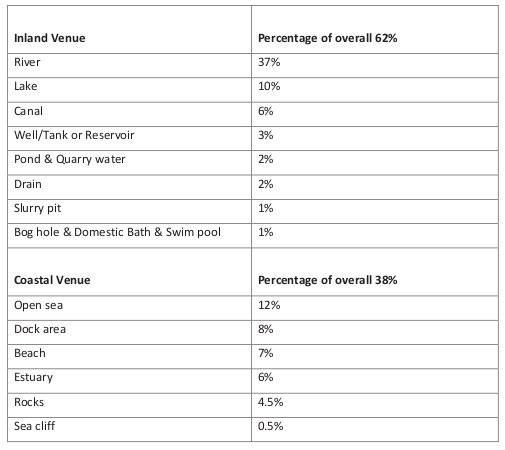 Inland also includes swimming pools which are less than 1% of drowning as Ireland is too cold for home or outdoor swimming pools to be popular here. If we look at the breakdown, one noticeable figure stands out. Rivers are three times more likely as a location for drowning than the sea, with lakes, which are often assumed to be safer, almost equal to the sea. drowning presents as principal region in nine counties, the majority of drowning incidents appear to happen in or surrounding urban settlement areas“. County Cork’s river Lee is the highest single location in the figures. 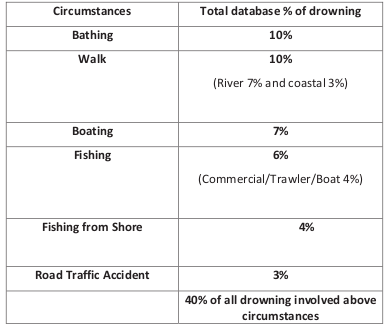 The IWS report also gives a breakdown of the circumstances leading to drowning. You’ve probably heard the old saw that the “strongest swimmers are the ones most likely to drown“. The report says that data on ability is lacking in 42% of cases, 26% are reported as poor and 33% as good, so there is some support for this notion but it’s hardly conclusive. In contrast, it says that 27% of cases involved some level of intoxication, and maybe a third of those were intentional. In the US, that figure is up to 70%. All this indicates that the “average” Irish drowning victim is a 42-year-old male, who has drank some alcohol, and is from the local area and the location is more likely to be a river near an urban location. The average US victim is younger due to an increase in child drownings. Minorities, whether racial or economic, are also more prone to risk. So what should you do? I tried to come up with a list of things that individual open water swimmers can do outside becoming qualified lifeguards. As swimmers we take absolutely for granted that every child should be taught to swim. As every experienced open water swimmer knows, alcohol should be absolutely avoided. If you see people drinking while around water or looking like they are going to get in, (this happens at the Guillamenes), try to talk them out of swimming. I know how these conversations go, they are not easy. Nonetheless. If you see small children without an adult, stay on watch yourself until you find their guardian. The figures suggest that children under 14 should also always be supervised around water. In your local location, in the absence of signs, flags or lifeguards, communicate any relevant local dangers to others. Wind, wave size, rip currents, tidal currents, exits, submerged rocks, jellyfish, weaver fish etc. I’ve found for example that casual bathers and inexperienced swimmers frequently underestimate wave size and exit difficulty. One problem I occasionally face is that teenagers assume if an “old guy” like me can get in the water, so can they. Even if it’s Force 5 with four metre waves. Be prepared to explain your experience and warn people off. If you don’t have life-saving experience or training, familiarise yourself with some basic techniques, such as throwing lifebuoys or rope, using approaching a drowning victim from behind instead of in front and contacting rescue services. Did you know that 112 is the emergency services number across all of Europe? Be wary at new locations. Be wary at rivers and lakes (hidden obstacles, fast currents, marine craft). Be wary in urban locations. Irish Water Safety 25 year report. WHO media report on worldwide drowning. CDC US water injuries, 2005 – 2009. CDC report on natural water setting drownings. The statistic breakdowns are very revealing. River dynamics are huge in comparison to that of the ocean. A question I always ask myself when crossing or walking along such is could I save a life in these conditions? Rivers are complex systems to navigate and the hazards are many. Even with an understanding of their behaviour it’s a daunting thought to even think about an all out rescue. River volume and flow are just two of the many things to consider. There are two categories of people who will succumb to drowning within seconds of entering a river. Namely suicide related and unsuspecting walkers or fishermen who had no intention of going in. In either case and regardless of swimming ability or initial intent, cold shock alone will be enough to cause rapid deterioration, panic and subsequent loss of control, and all this before having to deal with any of the remaining dangers. Rapid drowning will likely occur. It is probable that a greater amount of caution is exercised during the winter months around lakes, rivers, waterways and the sea than during the summer. If personal responsibility does not extend to understanding the dangers of alcohol and water then it’s a bit of a lost cause, I’m not sure if sense can be willingly accepted or humbly received. So for all the parents out there and teenagers who read this exceptional blog consider the following….. The conditions you were diving into in the morning will have greatly changed by late afternoon. All of a sudden what you were used to and familiar with will suddenly be unfamiliar and possibly frightening. Just because your mates are yelling at you to go for it doesn’t mean that you should. If your gut feeling tells you its a bad idea then it is! It takes more courage to walk away and come back another day, in the long run you will be the bigger man for it. Apart from your own safety you should always be on the lookout for others and be ready to raise the alarm by running and shouting for help. As you pointed out also Donal, sometimes people will assume it’s safe and follow the more experienced seemingly oblivious of the risk. That is where the experienced amongst us must by all accounts ensure to the best of our ability the safety of others. One thing I have found is that you can generally spot those who have perhaps bitten off more than they can chew. Sometimes the simple act of swimming along side them will be confidence boost enough to see themselves to safety. Thats why the buddy system works so well because it’s reassuring to see another person in the same conditions doing okay. If anything it may help relax and calm the fear and doubt that can so easily set in. I also think in general that you can encourage a swimmer to safety, it is however a fine line. Children under 12 in my opinion should be closely supervised by their parents. I remember running after my sister who had removed her floatation arm bands climbed out of the shallow end of the pool and legged it down to the deep end and with a flying jump went straight in. This was a 50 meter swimming pool and there weren’t many people around. Dad was up on the stand reading a book as usual. At the time I thought it was funny, that was until she went in and immediately began to drown and it was silent! No screaming no splashing just rapidly and silently disappearing. Before I had the chance to turn to Dad and call for help he was there on his knees by the side of the pool and in one go reached in and pulled her back up from beneath the water. He wasn’t impressed with the lifeguard who sheepishly came over slightly embarrassed. One thing that is often not talked about are ‘system accidents’. That accidents simply do not just happen they are instead assembled over time. That there is a well beaten path leading up to an accident. I guess it’s finding ways to increase awareness that will actually have an impact. Anyway I have rambled on perhaps a bit too much here, keep it up Donal. Hi Donal, this is an important topic and one also very relevant over our side of the North Channel, especially at this time of year. Last year saw a spate of drownings of mostly teenage boys followed by the usual (and somewhat hysterical and sometimes ill-informed) commentary about the water being freezing cold (all-year round apparently), undercurrents and weeds that pull you down. This is then usually followed by calls to ban swimming in reservoirs and quarries and advice for people to stick to swimming pools. This is of course totally separate to the people who drown while fishing or out walking their dogs but I suspect a common factor, often, is a lack of open water experience and personal survival skills. As we know, being able to swim 25m in a warm indoor pool with someone shouting encouragement is not the same as being able to save yourself from a fully clothed unexpected dunking in cooler water than you’re used to when you’re all alone. Even for people who voluntarily enter the water, cold water shock and the ensuing panic could be a significant cause of drowning. The good thing about the sea is that (if you swim from a beach at least) your entry is usually gradual, you can stay within your depth and exit is usually easy. This might not be the case if you jump into a deep, fast flowing river. Part of the solution, rather than trying to scare people off, might be to encourage more people to swim outside to gain experience of natural water conditions and an ability to judge the risks. Thanks. Simon. p.s. there are excellent statistics on drowning available for the UK.